We examine the statistical properties of some 2700 bipolar magnetic regions (BMRs) with magnetic fluxes ≥3 × 1020 Mx which erupted during 1976–1986. 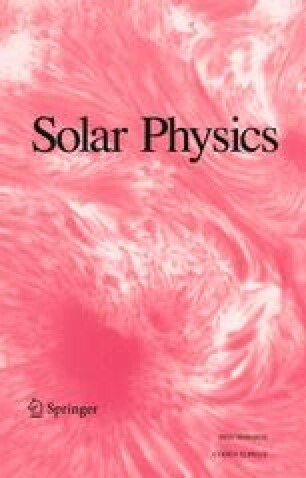 Empirical rules were used to estimate the fluxes visually from daily magnetograms obtained at the National Solar Observatory/Kitt Peak. Our analysis shows the following: (i) the average flux per BMR declined between 1977 and 1985; (ii) the average tilts of BMRs relative to the east-west line increase toward higher latitudes; (iii) weaker BMRs had larger root-mean-square tilt angles than stronger BMRs at all latitudes; (iv) over the interval 1976–1986, BMRs with their leading poles equatorward of their trailing poles contributed a total of 4 times as much flux as BMRs with ‘inverted’ tilts, but the relative amount of flux contributed by BMRs with inverted or zero tilts increased as the sunspot cycle progressed; (v) only 4% of BMRs had ‘reversed’ east-west polarity orientations; (vi) although the northern hemisphere produced far more flux during the rising phase of the sunspot cycle, the southern hemisphere largely compensated for this imbalance during the declining phase; (vii) southern-hemisphere BMRs erupted at systematically higher latitudes than northern-hemisphere ones through most of sunspot cycle 21. 1.E.O. Hulburt Center for Space Research, Naval Research LaboratoryWashington, DCU.S.A.